Governor David A. Paterson proclaimed September 23, 2009, as Stem Cell Awareness Day in New York State. Governor David A. Paterson proclaimed September 23, 2009, as Stem Cell Awareness Day in New York State, joining organizations and individuals across the country that work toward realizing the benefits of stem cell research in celebrating the field's accomplishments and promise. The state also held a stem cell image contest. The winning images will be turned into a calndar in 2010. 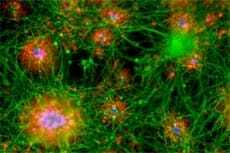 One winning image, shown here, depicts neural stem cell rosettes and was taken by NYSCF Fellow Christopher Fasano, PhD.